Chakameh Ganji handles a diverse range of business, insurance and investment-related litigation issues in both state and federal court. Chakameh is involved in all phases of the litigation process, including discovery, researching complex and novel issues, drafting motions and the analysis of documents and exhibits involved in complex litigation. She also advises clients on pre-litigation matters, post-litigation matters and general business litigation in both state and federal courts. 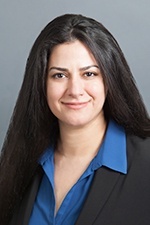 Chakameh joined Hinshaw as an associate in 2016. Previously she was a law clerk and summer associate with the firm. During law school, she served as judicial extern to the Honorable Victoria S. Kaufman, U.S. Bankruptcy Court, Central District of California. She also worked in the legal department of a large entertainment company. Prior to beginning her legal career, Chakameh worked in the financial services industry.